Relocation of Industries | DSIIDC - Delhi State Industrial And Infrastructure Development Corporation Ltd.
With the onerous responsibility of fulfilling the dreams of industrial entrepreneurs of Delhi, relocation of industries has been the prime concern of DSIIDC. Under the directions of Hon’ble Supreme Court, the Commissioner of Industries, Govt. of Delhi had formulated the scheme of “Relocation of Industries” in the year 1996. The rationale of the scheme is to reposition and manage the operation and maintenance of industrial units working in the non-conforming/residential areas of Delhi to conforming areas in NCT of Delhi. DSIIDC has taken significant steps poised to overhaul and bring about a holistic transformation in the flourishing capital. Dreams have been realized and lives positively impacted through diverse projects which are at various stages of commencement and/or execution. To begin with allotments of flatted factories and developed industrial plots have been made to applicants by draw of lots in the newly developed industrial areas of Narela, Bawana, Patparganj, Badli, Okhla, Jhilmil Industrial Area etc. Projects in pipeline include development of a knowledge-based industrial park in Baprola, multi level manufacturing hub for the SMEs at Rani Khera on Rohtak Road, Delhi etc. Change of Constitution (COC) - Proprietorship | Partnership | Private Ltd. Co. Result of Draw held on 18-03-2011 under Relocation Scheme. 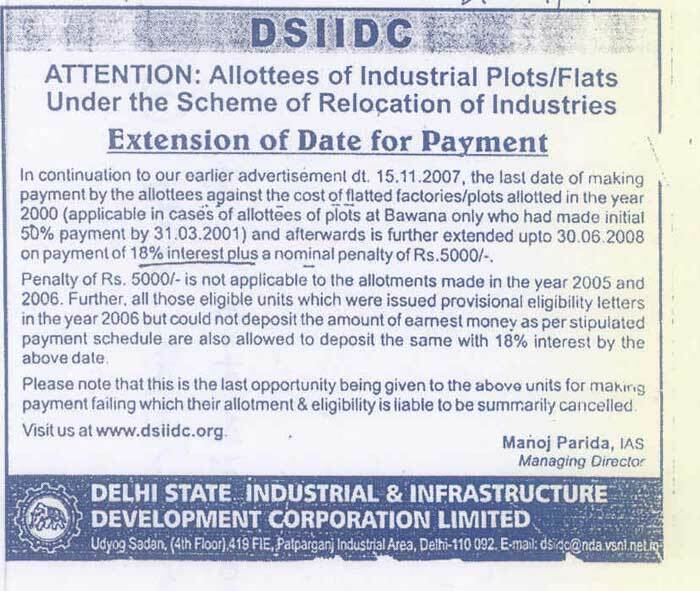 2) cancellation of allotments of flatted factories at Jhilmil flatted factory complex and industrial plots at Bawana & Narela industrial complexes due to non-payment by concerned allottees till last date extended upto 31-03-2016 with interest. Press Advertisement on 11.06.2013 regarding Final Notice to Bawana-II (Bhorgarh) Allottees to deposit cost of their plots - Last Date 30.06.2013 (with interest)"
Notice - Attention Allottees of Bawana and Bhorgarh (Bawana-II) Plots (18.03.2011 Draw). 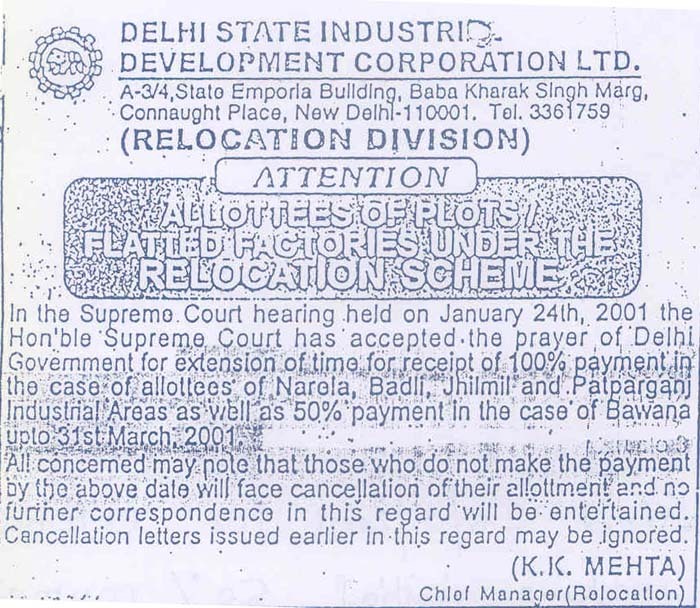 Notice for payment of cost of Bawana-II (Bhorgarh) industrial plots along with interest by 31.08.2012. Orders dtd. 24.01.2001 of Hon'ble Supreme Court of India for payment of initial 50% cost of Bawana plots & 100% cost of other areas namely Narelas, Badli, Jhilmil & Patparganj upto 31.03.2001. Disclaimer :- "All efforts have been made to provide correct/updated information. In case of any discrepancy, the applicant is advised to contact Relocation Division of DSIIDC."